“These are questions that haven’t been fully explored yet and I’m shouting as loud as I can saying that we need to explore them,” says Sanjay Limaye, an atmospheric scientist from the University of Wisconsin, Madison and a former chair of NASA’s Venus Exploration Analysis Group. The conditions on Venus are hard to describe. Many planetary scientists say "Start by imagining Hell and work up from there." It's an environment where words like "over 500 degrees Celsius" get thrown around, and it's flat-out crushed every probe we've sent into it. Even worse, there's almost no water. But, the question of life on Venus, of all places, is intriguing enough that a team of U.S. and Russian scientists working on a proposal for a new mission to the second planet — named Venera-D — are considering including the search for life in its mission goals. If all goes as planned, an unmanned aerial vehicle could one day be cruising the thick, sulfuric acid clouds of Venus to help determine whether dark streaks that appear to absorb ultraviolet radiation could be evidence of microbial life. Venus has long been a focus of Russian planetary science, which has the proud legacy of the record-breaking Venera space probes that landed on the Venusian surface in the late 1970s and early 1980s. With many questions remaining unanswered, the joint mission of Roscosmos and NASA, if approved, would see an orbiter launch towards Venus in 2025 with the aim to make remote-sensing observations of the planet and its atmosphere; deploy a lander on the surface; and search for future landing sites. Among several possible additions to the mission are a small sub-orbiter to study Venus’ magnetosphere, and either a balloon or an unmanned aerial vehicle (UAV) taking measurements of the atmosphere over a long duration. Should the UAV be approved, its main goal would be to take meteorological measurements to determine why the atmosphere rotates so fast relative to the surface, a phenomenon known as super-rotation. This fast rotation was discovered in the 1960s by astronomers tracking the motion of the dark streaks in the atmosphere. Puzzlingly, astronomers do not know the origin and composition of these dark streaks, nor do they understand why the streaks haven’t mixed with the rest of the atmosphere and why they are absorbing ultraviolet light. According to Limaye, the nature of the UV absorber is completely unknown. It could be particulate matter mixed into the clouds, or a substance that has been dissolved by the droplets of sulfuric acid, or perhaps crystalline in nature, like ice. Iron chloride has been proposed, but there is no confirmed mechanism that could loft particles of iron chloride 50 to 60 kilometers above the surface, particularly as winds near the surface only blow weakly through the dense lower atmosphere. A more exciting explanation for the dark streaks is that they are evidence of microbial life. “It’s a possibility we can’t overlook,” says Limaye, who is a member of the Venera-D science definition team. Finding life at high altitude in the atmosphere of a planet would make sense. After all, microbes have been found at similar heights in Earth’s atmosphere. 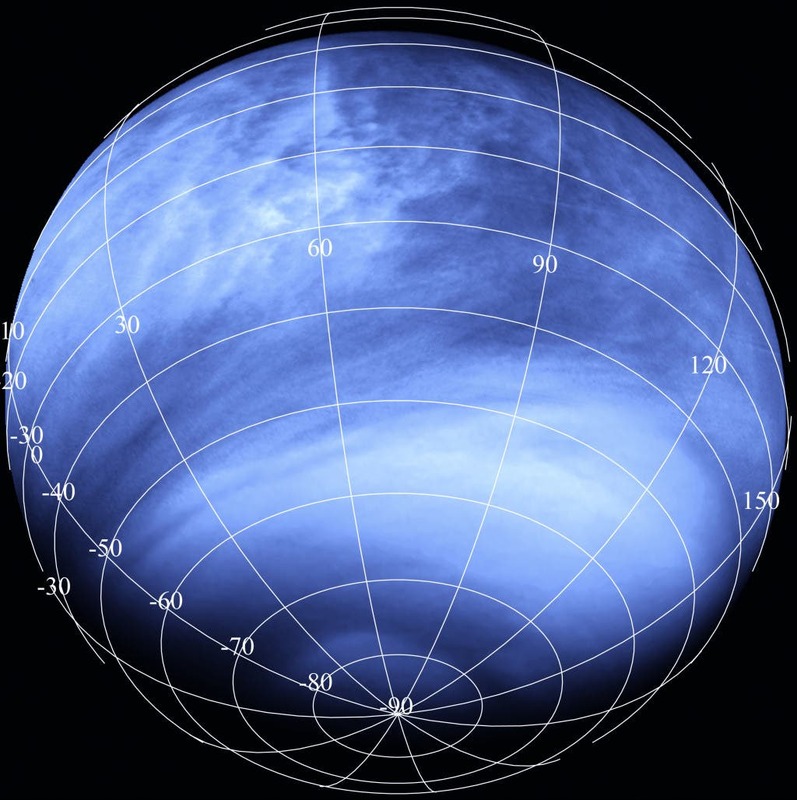 The challenge for life on Venus is the planet’s extreme temperature. The surface, at 462º C (864º F), is hot enough to melt lead, and the surface pressure of 92 bar is the equivalent of being almost a kilometer under water. However, in a region beginning around 50 kilometers in altitude and extending a dozen kilometers outward is a sweet spot where the temperature ranges between 30ºC and 70ºC (86ºF to 158ºF) and the pressure is similar to Earth’s surface. Life could potentially survive in this zone where the dark-streaking UV absorber is found. Intriguingly, the sulfuric acid droplets within the clouds aren’t necessarily a show-stopper to life. Earlier Venera missions detected elongated particles in the lower cloud layer that are about a micron long, about the width of a small bacterium. These particles could be coated in ring-shaped polymers of eight sulphur atoms, called S8 molecules, which are known to exist in Venus’ clouds and which are impervious to the corrosive effects of sulfuric acid. Furthermore, S8 absorbs ultraviolet light, re-radiating it in visible wavelengths. If the particles are microbes, they could have coated themselves in S8, making them resistant to the corrosive effects of sulfuric acid. It has even been postulated that the S8 exists as a result of microbial activity. Is this then the key to life on Venus? Venus seen in ultraviolet light by the European Space Ageny’s Venus Express mission. The dark streaks in the clouds are where an unknown material is absorbing ultraviolet light. Could it be life? Image: ESA/MPS/DLR/IDA. The original Russian plan for Venera-D featured balloons patrolling the atmosphere, but balloons are not very maneuverable and would not necessarily be able to reach the regions with the dark streaks. A solar-powered UAV would stand a far better chance. 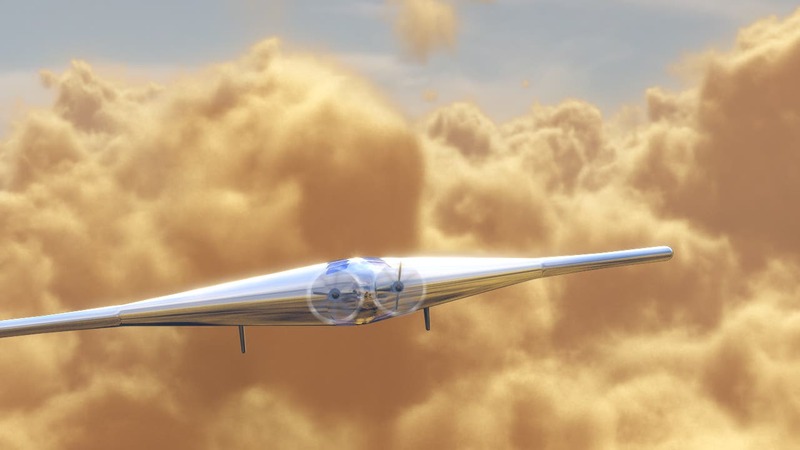 “The idea is that with a large enough wing span you can generate enough power and actually fly through the atmosphere of Venus, with electric propellors, for a very long time,” says Limaye. Descending hypersonically into the atmosphere after detaching from the orbiter, the UAV would be filled with hydrogen or helium gas, keeping it buoyant at a nominal floating altitude of 50 kilometers, allowing it to glide through the clouds while moving through the night-time hemisphere. Upon daylight, the solar-powered propellors would kick in and raise the craft’s altitude to around 60 kilometers. Over the course of three to four days, the craft could move around the planet along the upper atmosphere’s ‘super-rotation,’ the strange phenomenon where the atmosphere seems to be uncoupled from the solid planet and rotates much faster. The UAV would therefore be able to explore the clouds at different altitudes, moving from air mass to air mass, from regions with UV absorbers to regions devoid of them, sampling and measuring the composition of the atmosphere. The aerospace company Northrop Grumman has already independently developed a concept for a Venusian UAV, called VAMP (Venus Atmospheric Maneuverable Platform), which would have a giant 55-meter wing-span and be designed to operate in the atmosphere for at least a year. The ‘D’ in Venera-D’s name stands for “dolgozhivushaya,” which in Russian means “long-lived.” This originally referred to the hopes of keeping a lander operational on the surface for days or weeks, although the oppressive conditions on the surface mean that realistically the most that any lander could survive is mere hours. Instead, the UAV, continually circling around Venus, would take the mantle of being long-lived. The final report describing the science goals of the Venera-D mission will be submitted to Roscosmos and NASA by the end of January 2017, at which point the two space agencies will have to decide whether they will collaborate on the mission. An answer not expected until late 2017 at the earliest. Eco-Alert: "Human Civilization has Crossed Four of Nine Planetary Boundaries"